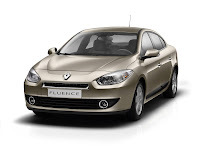 Renault Fluence was designed with the aim of standing out as the most attractive car of its class and several features set it apart from rivals: beneath its strong, sporting exterior, Fluence features a comfortable cabin and a barrage of useful technological aids. Fluence targets customers looking for a status-enhancing saloon and will be built on the existing assembly line at the Oyak-Renault plant in Bursa, Turkey, where the booted Mégane II was previously produced. more passenger space than any main rival, including 1,480mm of elbow room at the front and 1,475mm at the rear. the driver's seat has a huge range of adjustments, 240mm fore or aft and +/-35mm in terms of height; the steering wheel can be adapted for rake and reach, too. a climate control system with front and rear vents is standard, even on entry-level models; automatic dual-zone climate control is available as an option. a wide range of audio options including the range-topping 3D Sound by Arkamys® system, Bluetooth® telephony and 'Plug & Music' digital connectivity. 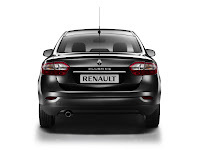 a comprehensive choice of engines, with four petrol and five diesel Renault eco² options. reliability and durability proven by a ferocious testing regime; our quality control systems are designed with certain markets' most demanding road conditions in mind. 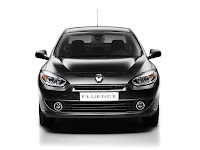 in 2011, the Renault range will be boosted by the introduction of an all-electric version of Fluence – proof that attractive, comfortable, spacious cars are by no means incompatible with respect for the environment. 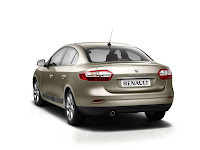 Renault Fluence goes on sale in Turkey from November and will benefit from the Mégane II fourdoor's fine reputation in three best-selling markets: Turkey, Russia and Romania. 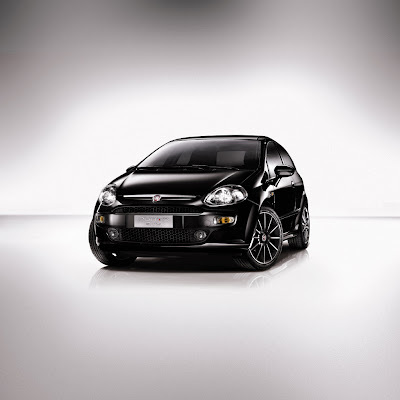 TURIN : August 31, 2009 - The Fiat Punto Evo, the evolution of the Grande Punto, will make its debut at the next Frankfurt Motor Show. It is destined to repeat the success of its predecessor and become the new pacesetter for innovation, safety and style, thanks to its many innovative features. The epithet “Evo” identifies a level of car design that is capable of satisfying even the most demanding customers in terms of technology, driving pleasure and respect for the environment. 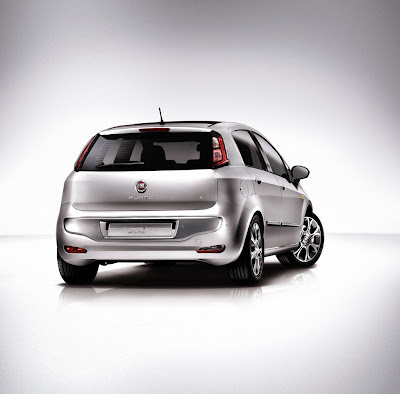 Finally, the new Punto Evo is even more attractive thanks to the work of Fiat’s Centro Stile. The interiors (fascia, seats and instrumentation) have been completely renewed to become even more prestigious and elegant, and the outside has been given a thoroughly restyled look too. The Fiat Punto Evo goes on sale in the second half of October with the precise objective of consolidating its role as one of Europe’s market leaders in the highly important compact segment. Developed and patented by FPT – Fiat Powertrain Technologies – MultiAir technology will gradually be adopted by all engines fitted to Fiat Group cars. The heart of MultiAir is a new electrohydraulic valve management system that reduces fuel consumption by controlling air directly via the inlet valves (without using the throttle). MultiAir reduces emissions (thanks to improved combustion control) and also improves performance by boosting both power and torque. The new Punto Evo is even equipped with the latest version of the Blue&Me system. “Blue&Me–TomTom” is a fully integrated infotainment system that lets you manage telephone, navigation and information functions on a practical colour touch-screen. 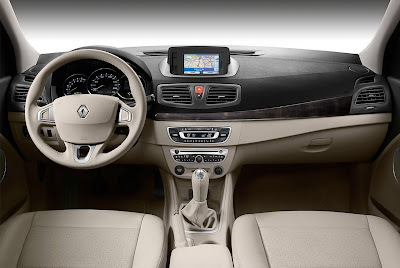 The system is the result of a partnership between Fiat Group Automobiles and TomTom, European leader in portable navigation systems, and integrates with the car’s other systems thanks to the Blue&Me system developed in conjunction with Magneti Marelli. The new system also incorporates “eco:Drive Info” for real time information on your driving style and useful suggestions for reducing environmental impact and optimising consumption by changing gear and using the accelerator to suit the nature of the route. Then there is the LPG-fuelled version, developed using Fiat’s longstanding experience in alternative fuels to respond to the extraordinary growth seen in this market. The Punto Evo GPL boasts record autonomy of 1,500 km in the extra-urban cycle, and running costs up to 50% lower than a petrol equivalent. 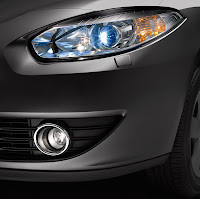 The Punto Evo is also one of the few cars in its class equipped with adaptive 'cornering' front fog lights that switch on automatically with dipped headlights according to the angle of steering. And don’t forget that the new Punto Evo also guarantees constant and reliable road holding thanks to electronic dynamic control systems for braking and steering. The ABS system that is available across the complete engine range incorporates EBD (Electronic Brake force Distribution), ESP (Electronic Stability Program) and Hill-holder to help with hill-starts. 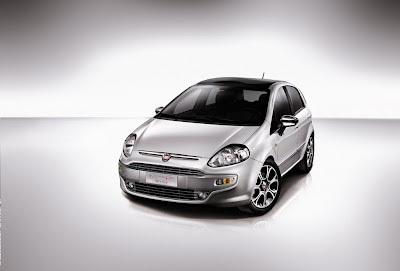 The Punto Evo is more stunning than ever thanks to the work of Fiat’s Centro Stile. 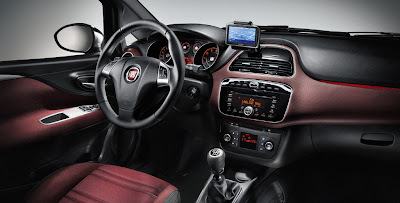 In particular, the interiors of the new model have been completely redesigned to represent the most evolved expression of Italian style, with top quality materials and superb attention to detail. The result is a bright and elegant cabin with completely renewed fascia, seats, storage compartments and instrumentation. 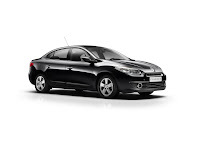 On the outside, both the front and the rear have been thoroughly restyled, as shown by the attractive lines of the new bumpers and the incorporation of innovative and original headlights and taillights. The latest design has also “stretched” the car to a total length of 406 centimetres, so that its winning characteristics of driver and passenger comfort remain unchanged. 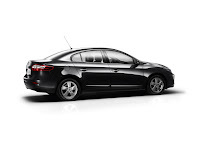 The other external dimensions remain the same, with a width of 169 cm, a height of 149 cm and a wheelbase of 251 cm. 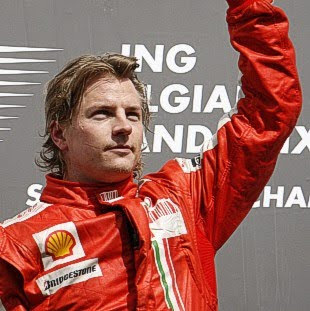 SPA FRANCOSCHAMPS : August 30, 2009 - Kimi Räikkönen (Ferrari) won the Belgian GP at Spa on Sunday after a lap-one incident eliminated four cars including world champion Lewis Hamilton. Räikkönen hit the front on the fourth lap but he was hounded from start to finish by pole man Giancarlo Fisichella who finished in second place, less than a second behind. Sebastian Vettel (Red Bull-Renault) was third, 2.9 sec behind. It was Force India's first championship points and underlined Fisichella's pace in qualifying when he took pole position. Despite five mediocre races in a row, Jenson Button, who failed to finish at Spa after being eliminated on the first lap, was able to retain his lead in the drivers' world championship by 16 points. Giancarlo Fisichella took the lead in the Belgian GP at Spa on Saturday after taking pole position on Saturday. Rubens Barrichello, who was fourth on the grid, was left standing at the start as most cars got through the La Source hairpin without incident. Kimi Räikkönen (Ferrari) went wide at the hairpin and rejoined the track in third place. Fisichella was leading and being chased by Robert Kubica (BMW Sauber) but Räikkönen had a run at him down the back straight and got past into second. The top few cars got through Le Comte, but Jenson Button (Brawn-Mercedes) got hit from behind by rookie Romain Grosjean (Renault) under braking and Button spun. causing the cars behind to brake hard and Lewis Hamilton (McLaren-Mercedes) was hit by Jaime Alguersuari (Toro Rosso-Ferrari), all four cars retiring on the spot as the safety car was deployed. The race got back under way on the fourth lap, and Räikkönen used the advantage of the Kinetic Energy Recovery System on his Ferrari to power past Fisichella on the back straight and take the lead. Barrichello, still recovering from his poor start, got past Luca Badoer (Ferrari) into 13th place on lap 5. Giancarlo Fisichella had placed his Force India-Mercedes on pole, his team's first ever, but he had been fuelled light and only Rubens Barrichello (Brawn-Mercedes) was lighter of the top ten cars on the grid. With a clear track ahead and his tyres now up to working temperature, Räikkönen reeled off a series of fastest laps with a 1'49.090 on lap 6 as Barrichello got past Kazuki Nakajima (Williams-Toyota) into 12th. Räikkönen set a new target of 1'47.749 on the eighth lap. Glock and Kubica were the first cars to make a routine stop for fuel and tyres, rejoining inside the top ten. Nick Heidfeld (BMW Sauber) was fourth and easily able to match the pace of the race leader and he set a new fastest lap of 1'47.738 on lap 132. Jarno Trulli had placed his Toyota on the front row of the grid, but was running down in 12th place. On lap 13, Webber and Heidfeld pitted together. Heidfeld left his pit and came down the pit lane, but Webber dived out of his pit in front of the German, forcing him to brake and swerve, and the Australian was given a drive-through penalty for dangerous driving. Sebastian Vettel (Red Bull-Renault) was next to have a go on the quickest time, setting a 1'47.646 on lap 14 and taking the lead as his tanks emptied. He pitted two laps later dropping back into eighth place. After the first round of pit stops, Räikkönen regained the lead. It was his 150th grand prix and he was the only driver on the grid to have won at Spa. Fisichella was easily able to match the pace of Räikkönen and the Force India-Mercedes was just a second behind the Ferrari after 20 laps of racing, with Kubica a further 6.1 sec back. On lap 23, Trulli returned to the pits and was wheeled into the Toyota garage and retirement, a sad result from his front-row start. On lap 24, Fernando Alonso (Renault) pitted but there were problems with his left front wheel spinner after a lap-one incident had damaged it. The long stop cost him about 20 seconds and he rejoined the race in 14th place. The spinners give cars an advantage of just 0.1 sec a lap and they will be banned from next year. Alonso's pit crew radioed Alonso to tell him to return to the pits due to a problem with the front left wheel. Alonso was penalised after a similar incident in Hungary when a wheel not properly tightened by his pit crew fell off his car. He pitted and retired for the second time in two races with the same problem. Fisichella was still maintaining maximum pressure on race leader Räikkönen and was just a second behind. Kubica was still in touch, five sec behind Fisichella, with Vettel four seconds adrift. There was a nice dice for seventh place between Glock and Webber who was just 0.7 sec behind. Behind them, Heikki Kovalainen (McLaren-Mercedes) and Sébastien Buemi (Toro Rosso-Ferrari) were disputing ninth place. Kubica pitted on lap 30, releasing Vettel to be able to try to reel in second-placed Fisichella. On the next lap, race leader and second-placed Räikkönen and Fisichella pitted together. There was slick work by both pits and the Finn retained his lead one second ahead of the Italian. Vettel now became the race leader as he had further to go before his second pit stop. Heidfeld was down in fifth place, 3.9 sec behind Kubica, and homing in on the cars ahead, setting a new fastest lap of 1'47.541 on lap 34. He repeated the feat on the next lap with a 1'47.371. Räikkönen was back in the lead after Vettel's final stop and he still had Fisichella less than a second behind him with Vettel in third, 5.0 sec behind. With three laps remaining, Barrichello was right behind Kovalainen and trying to get past into sixth place, but the Brazilian's engine began smoking and his pit crew told him to back off and save the motor. He did so and let Kovalainen off the hook. With two laps left, Barrichello's car began smoking badly as Rosberg and Webber closed in for the kill. But the Brazilian held on to the line, with the two pursuers crossing the line right behind him. 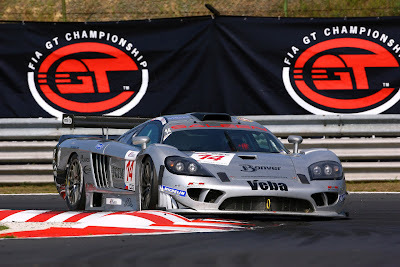 BUDAPEST : August 30, 2009 - In bright sunshine and in front of a crowd of 15,000 people at the Hungaroring, Czech team K plus K Motorsport took its second win of the season, after an action-packed race for Karl Wendlinger and Ryan Sharp. They finished ahead of the nr 1 Vitaphone Maserati MC 12 of Michael Bartels and Andrea Bertolini, who, despite 80 kg success ballast, regained the lead of the GT1 Drivers classification, with the nr 33 Vitaphone Racing Team DHL Maserati MC 12 of Alessandro Pier Guidi and Matteo Bobbi third. Hezemans and Kumpen, in the nr 4 Pekaracing Corvette, were sixth, losing their points lead but also significantly reducing the weight of their car for the next round in the Algarve. In GT2, the nr 60 Prospeed Competition Porsche 997 GT3 RSR recovered from the back of the grid to overtake the nr 50 AF Corse Ferrari and secure the victory on the very last lap, Richard Westbrook and Emmanuel Collard claiming their third win of 2009. 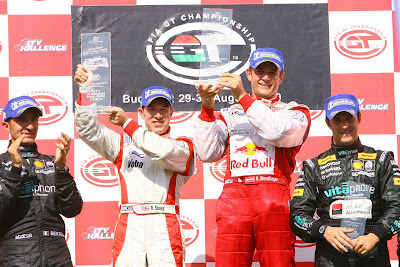 Toni Vilander and Gianmaria Bruni finished second, despite carrying a total of 100 kg penalty weight, to retain a two-point lead. Paolo Ruberti and Matteo Malucelli, in the nr 77 BMS Scuderia Italia Ferrari 430 GT2, finished third; their best result of the season so far. Luis Perez Companc, in the nr 95 Pecom Racing Team Ferrari 430 GT2, won the Citation Cup for gentlemen drivers.